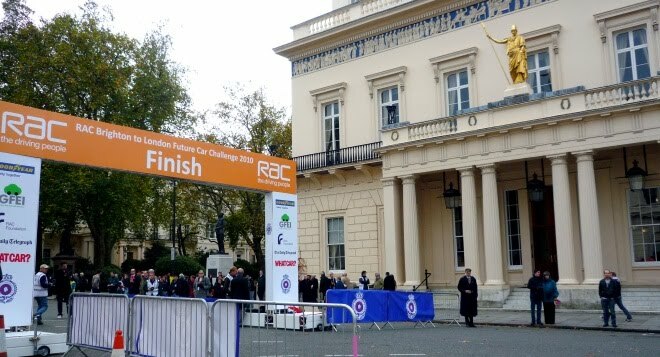 I went along to the Future Car Challenge on Saturday morning, to watch the cars cross the finish line outside the Anthanaeum Club, just off London’s Pall Mall. 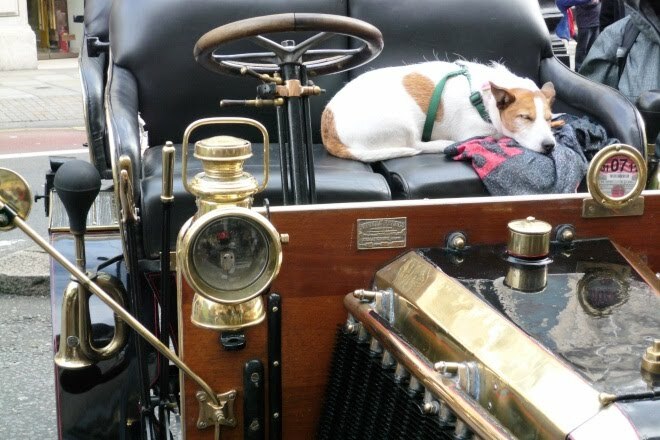 The cars had driven from Brighton to London, following the same route as the Veteran Car London to Brighton run, but running in the opposite direction and a day beforehand. And hopefully with fewer breakdowns. Lots of the veteran cars were pootling about the vicinity on the day, preparing to head to the seaside on the Sunday. 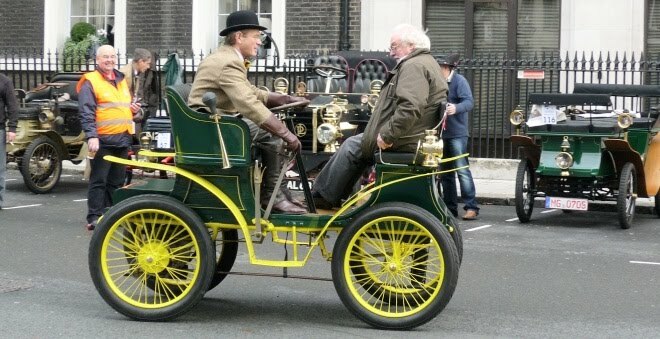 It made for a stark contrast to see horseless carriages vying for roadspace with engineless cars. 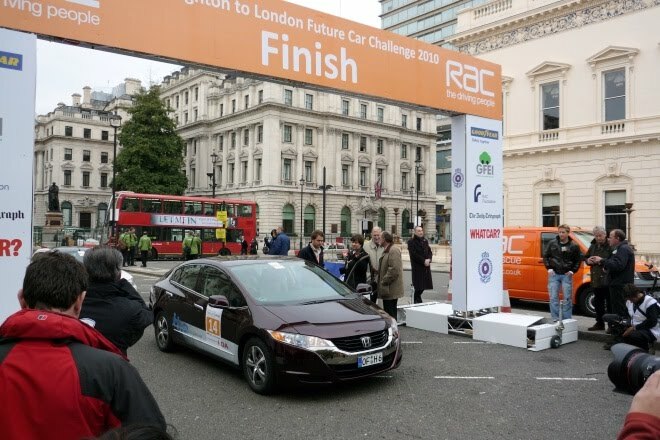 Cars taking part in the challenge were helped along the way by strategically placed bright-orange road signs, depicting some sort of Smart-car-style buggy. 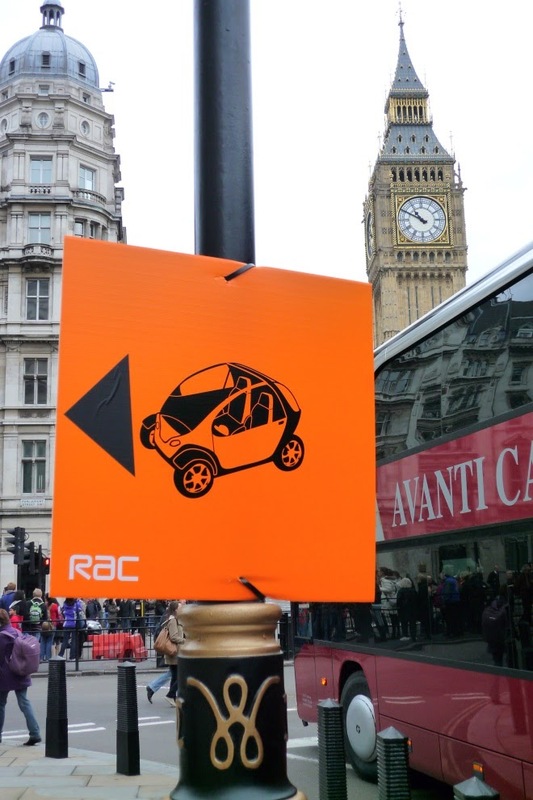 I snapped this sign in Parliament Square a few minutes before the first of the cars arrived and a small, evil part of me was tempted to unstick the self-adhesive arrow and reapply it, pointing the wrong way. Fortunately, the angelic part of me, perched on the other shoulder, prevailed. Eventually the first cars appeared, although it helped if you knew what you were looking for. 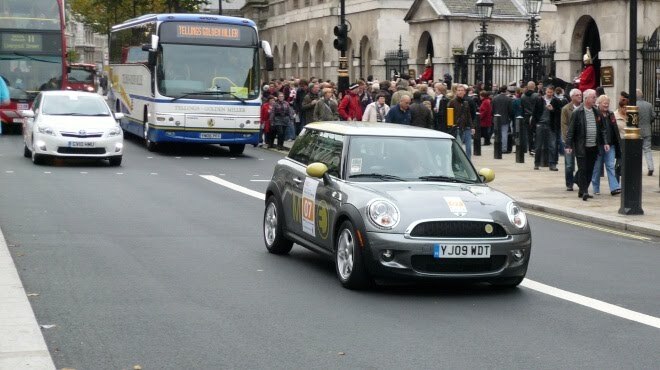 Here, a relatively anonymous electric Mini-E leads an equally unremarkable Toyota Auris hybrid up Whitehall. Note how members of the crowd are either walking blythely by without a glance, or are facing the other way, towards the mounted sentries outside Horseguards. It’s fair to say that pre-event publicity was muted. On arrival, cars were greeted by an equally sparse crowd. There might have been more onlookers, were it not for the event security people, who all seemed to have been recruited from the ranks of nightclub bouncers and were thus as friendly and welcoming as a punch in the face. I lost count of the times I was told to move, get out of the way, stand behind a barrier, stay on the pavement, or just generally get lost. After crossing the finishing line, drivers were cornered by geeky autograph hunters. Or possibly quizzed by official time-keepers – one or the other. This claret-coloured car is of course Honda’s hydrogen fuel-cell powered FCX Clarity. Liquid-fuelled cars had their consumption verified by brimming the tank. 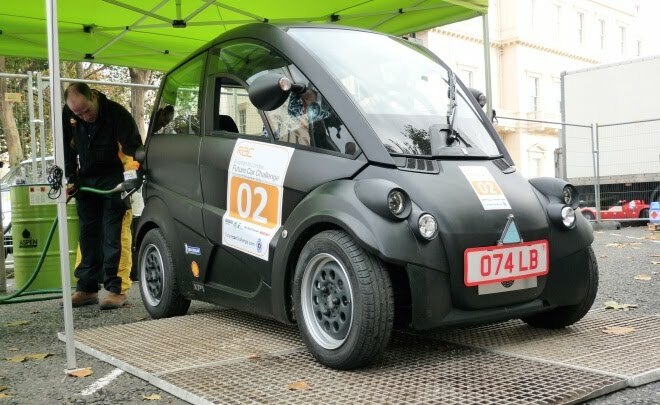 Gordon Murray’s amazing, trinket-like T25 sipped its way to London and won both of the two awards on offer for small, combustion-engined cars. Its rear-mounted, 660cc petrol engine eked out 96mpg. Murray reckons a small diesel in the T25 might beat 130mpg. One Toyota Auris HSD hybrid recorded a very impressive 72.8mpg over the 60-mile route from Brighton to London, and all eight examples on the run managed to beat the model’s official 70.6mpg combined cycle figure. It can be done, even by the normally lead-footed motoring journalists who made up most of the Auris driving team. 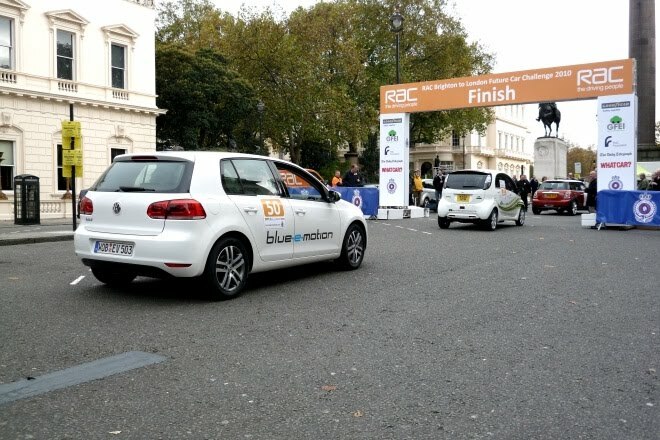 The battery-powered Volkswagen Golf Blue-e-motion picked up the prize for the best overall competitor, after the judges ruled that it had consumed the least energy of all the cars over the challenge route. No doubt it helped that it didn’t burn any fuel while queuing up to cross the finish line. Three frugal Vauxhalls turned up at once. The one nearest the camera gleaned quite a lot more attention than the other two, unsurprisingly. 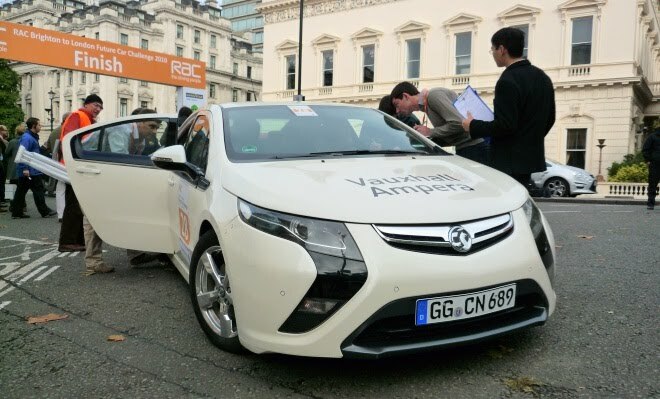 The German-registered Vauxhall Ampera looked suspiciously like an Opel with stuck-on griffins. Surprisingly, it didn’t win the extended-range electric vehicle category. That honour was bestowed on the Proton Exora people-carrier. 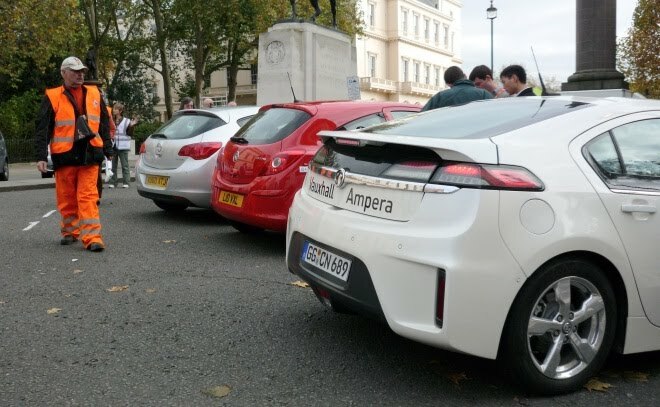 The Ampera did carry off the “public choice” award, via voting processes unknown. Nobody asked me. This is the Proton Exora range-extended electric vehicle, but then you knew that, didn’t you. Honda’s CR-Z won best sports hybrid – I’m not sure if there was any competition. Best light commercial vehicle with conventional propulsion went to the Ford Fiesta 1.6TDCi Econetic van. Very nice it is too if you need to carry stuff. Probably. All the cars received a wash and brush up before their afternoon parade on Regent Street. The driver of the Tata Indica Vista electric car understandably seemed keen on not having a jet-wash blast squirted at the charging socket. This Tata won the gong for best small passenger electric vehicle. At the end of the day, all the excitement was just too much for some.